Granite tiles have many applications from exterior and interior wall cladding, to kitchen flooring, tub and shower surrounds, to bathroom and kitchen countertops where tile is a much less expensive option than a slab. 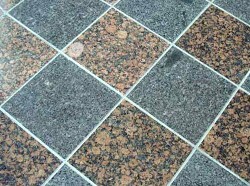 Not only is granite versatile, but it also offers far more color choices (thousands in fact!) and is more durable than any other material available. For pleasing bath or kitchen designs, you'll want to choose a granite color with a more uniform pattern and minimal movement (see patterns in photo) to avoid a sense of chaos in the design where the pattern / color clashes with the grout lines. Also, mixing colors (as in the photo) can be tricky. Granite is a commonly used floor tile in commercial buildings, but many people like it for kitchen flooring too where provides an extremely long-lasting surface that is easy to maintain since it does not etch. Staining is also easily controlled with a sealer, although many colors are nearly stain-proof and do not require sealing as is commonly (but incorrectly) claimed. Granite is an excellent choice for bathroom flooring as well... again for it's unmatched durability, simple maintenance and the broad range of color options. A honed finish is the best choice for secure footing. It isn't as popular as marble or travertine floor tile in the bathroom, which tend to have a warmer look and feel, but it has fewer maintenance concerns and can look warm and inviting too. Just like a granite slab, tile is a great idea for kitchen countertops. Tile countertops will require additional maintenance compared to a full slab due to the grout, but you can still achieve an upscale and elegant look with a granite tile countertop and a much smaller dent in your wallet! Expect to pay approximately 50% to 70% less. It's a good idea in this instance to simply carry the tile up the wall for a full granite backsplash to match the counter top. This style maintains cohesive grout lines while creating a dramatic anchor to your kitchen design. Of course, you still take advantage of all the qualities and characteristics that make granite the most popular choice for kitchen countertops... superior durability, heat, scratch and stain resistance, easy clean up and maintenance and a wider variety of colors than any other material.